Log cabins and timber frame homes present unique challenges to engineers, architects, builders and inspectors. In an effort to address these considerations and provide a baseline for log construction across code districts, the International Code Council developed the ICC 400-2012 log standards. If you build a log or timber frame house in the United States, you must follow the log standards provided in the ICC 400-2012 (Standard on the Design and Construction of Log Structures). The ICC 400-2012 log standards have been developed for use in the United States. Since log homes and timber frame homes can vary from the typical codes and standards this set of standards was developed with the help of The National Association of Home Builders’ Log and Timber Homes Council to address these differences. 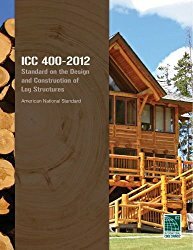 The ICC 400-2012 (Standard on the Design and Construction of Log Structures) is a document produced by the International Code Council and is the only document referencing log structures that has been approved as a consensus standard by the American National Standards Institute (ANSI). If you are building a log home subject to any of the other ICC codes such as IBC-building, IRC-residential, or IECC-energy conservation, you will need to adhere to ICC 400-2012 as this is referenced by them. Adoption of one means adoption of the other. Here we’ll highlight some of the key standards that are addressed in the ICC 400-2012, including Log Grading, Energy Conservation, Fire Resistance, Log Settling, and Roof Overhangs. All structural logs must be visually stress graded by an accredited grading agency. Logs must also have a certified moisture content if they have been claimed to be dried, such as kiln-dried. This provides an engineering baseline that can be referenced across log structures. 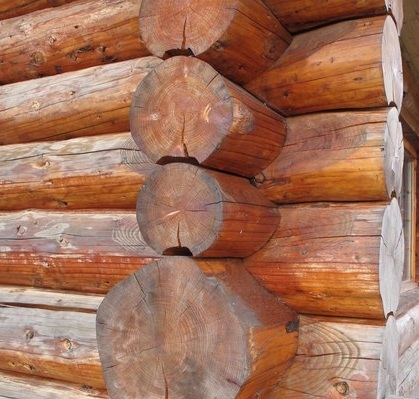 If a company belongs to the Log and Timber Homes Council, they have been certified to grade logs. Log homes have a unique thermal mass effect that provides for excellent energy conservation, but that is not adequately represented by measuring R-values. R-values were developed to measure insulation products and is a static measure of heat transfer not well suited to log walls. The difference between U-factor and R-value is that U-factor measures the rate of heat transfer (or loss) while R-value measures the resistance to heat loss. U-factors and R-values are inversely related, so while you want a high R-value you want a low U-factor to maximize the energy efficiency of log homes. Instead of using R-values to comply with the energy code, the ICC 400-2012 uses a prescriptive U-factor for logs of a given width and species. In addition, the standards provide requirements to minimize air exchange rates and air infiltration to improve energy conservation. While a wooden home may seem like a fire hazard, the sheer mass of wood in a log home makes it difficult to sustain a fire compared to the smaller studs used in typical frame construction. ICC 400-2012 addresses this by prescribing a minimum width of 6” for a log wall used for 1-hour fire separation. This helps code officials in ascertaining the fire-resistive construction of a cabin. Log settling is a result of log grade, moisture content and log shape. ICC 400-2012 addresses these, as well as joints, sealants and log wall intersections. Adhering to these log standards will ensure that there is minimal settling as the log walls dry and accommodate any shifting. We’ve stressed in our log cabin maintenance and cabin roofing pages how important it is to use long roof overhangs to shelter the log walls from sun and rain. Repeated wetting and drying, especially of lower log courses, can lead to the deterioration of logs and costly cabin repairs. Even the landscaping for your log home is important to take into consideration. The log standards address the need for minimum roof projection requirements, measuring horizontally from the face of the exterior wall to the drip line at the edge of the overhang. Log standards have been developed to enable builders to use logs that meet building code regulations for strength, fire resistance and stability. These standards enable engineers, builders and code officials to evaluate log structures accurately and consistently.